My thirst for books set in 16th century England is absolutely insatiable. Nancy Bilyeau's new (and FIRST!) book just helped whet that constant need. What appealed to me was the relatively unfamiliar settings and perspectives in her book. The Crown takes place in the midst of the Reformation. Henry VIII is trying to rid England of Catholicism - mainly by emptying out the abbeys and taking the wealth there for himself. Monks and nuns being forced from their lifestyles and beliefs in these abbeys were left in helpless and pitiable situations. Our heroine in The Crown is Joanna Stafford, a Dominican nun who is also of royal blood. She sneaks away from Dartford Priory when her cousin Margaret Bulmer is sentenced to burn as a traitor for resisting the Reformation. At the execution site, she and her father are arrested for causing a ruckus and are sent to the Tower. There, Bishop Stephen Gardiner (that old grumpy guy who always wears purple robes on The Tudors) offers her a deal in exchange for her release and her father's life. Joanna must search and find him the legendary Athelstan crown, supposedly hidden in her abbey. This crown is said to offer the rightful owner great power and defeat against enemies; Gardiner desires to use the crown to sway the Reformation in his favor. In her search, Joanna meets a mysterious monk named Edmund, a charming civilian (creating an odd love triangle of sorts), and runs into more murders, sickness, and betrayl than I think the average nun did. The action and mystery is nonstop! One of my first impressions about The Crown was how great it was to read a book that takes place in Tudor England but does NOT focus on Henry VIII or one of his wives. Katherine of Aragon and Anne Boleyn both do play a part, but Prince Arthur and George Boleyn are the main focus of their stories, respectively. It was interesting to get a fresh perspective on the events I've already read so much about. I also loved all of the various characters we met along the way. I specifically liked finding out the reasons why some of the nuns and monks decided to join the church; some were truly pious to God, others simply traumatized in their childhood for various reasons. There was such great characterization and variety! The only lingering feeling that is still bothering me is the ending: I wouldn't say it's exactly a cliffhanger, but it didn't feel completely wrapped up. I wanted to know specifics! Readers may be me left demanding a sequel - not that that's a bad thing! If you like history, religion, and mystery (from that description, this book sounds similar to The Da Vinci Code...it's not.) then this book is for you! 4 stars to a great debut novel. 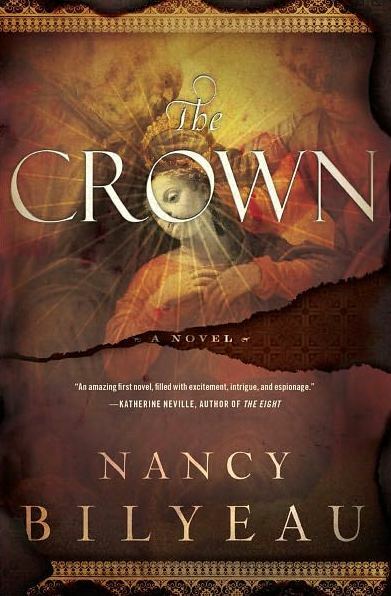 Due to limited space and an impending move later this year, I am giving away my copy of The Crown to one of you! Open to US residents only, enter by filling out a short form HERE! You have until March 16th. Good luck! Love this review. Sounds like my kind of book. Tudor England, but not Henry VIII... I'm intrigued. Thanks for the giveaway. Pick me! Pick me! Interesting review about the search for a crown that has magical powers. I am curious as to why this mythical crown is so little known. I'm like you... If I'm reading about this period I'd rather NOT read about Henry VIII or one of the wives - feel like it's overdone. I like that you mentioned why people joined the church during this time. I always thought a lot of people, women especially, then weren't really joining for the right reason. It was either marry or join the convent. Sounds like an interesting read with lots of twists and turns!